Why would a woman who loves mystery novels want to write about a truck driver? It seemed like a good idea at the time. It began back in 1994. I wanted to write a mystery series with a male protaganist, similar to the mysteries I loved to read, but I wanted a unique character. I enjoy reading about moody L.A. homicide detectives, brilliant Scotland Yard detectives and smart aleck private eyes, but I felt that I couldn’t do a character in those professions justice, and other writers had already created series that I couldn’t compete with around similar characters. That’s how I first decided on the main character in my Hunter Rayne highway mystery series. He’s a former Royal Canadian Mounted Police homicide detective who resigned from the force after over twenty years of exemplary service after the sudden death of his colleague and best friend, and a painful divorce that caught him by surprise. He’s hoping that the solitude of life on the road will help him to heal from what he considers his personal failures. As much as Hunter tries to keep his new life simple and uncomplicated, circumstances, with the help of his boss, Elspeth Watson, conspire to get him involved in murder investigations even in his civilian life. As a boy, his heroes were cowboy crusaders like Roy Rogers and the Lone Ranger, and he just can’t seem to let go of what motivated him to become a law officer in the first place, that need to see the guilty party captured and justice done. My books aren’t thrillers or full of heart pounding suspense, but they will keep you guessing. Does the idea of a trucker turn off some women mystery readers? Maybe so. But I must be doing something right. My second novel Ice on the Grapevine is a finalist for the 2012 Global Ebook Award in the mystery category. Both novels are now available in print editions as well as ebooks. They’re available online from Amazon, Barnes & Noble, and other sites, or from Proud Horse Publishing, or you can ask your local bookstore to order them. Just quote the ISBN numbers. “Those were the best mysteries I’ve read in a long time!! As soon as I finished the first one I bought the second and felt empty when I finished it! The characters were awesome and so there that I somehow think they are in my life and I should be bumping into them at IGA or Gibson’s Building Supplies!” Judi H., Roberts Creek, B.C. “… this book caught my attention from the very first pages and it only got better. …I recommend this book to anyone who has a love for a good mystery. I usually figure out who the guilty party is when I read a book but this time it was a surprise. I think that Hunter Rayne would make a great TV detective, driving around the country in his rig visiting different states and helping to solve crimes. He is that interesting of a character.” See full PRG review of Ice on the Grapevine by Linda Tonis. “The Hero to me is the heart of the story and having only just discovered a second book in this series I’m anxious to read more.” See reviews for Slow Curve on the Coquihalla on Amazon. See full reviews for Ice on the Grapevine on Amazon. Check out my interview on Laurie Hanan’s Mondays are Murder blog. 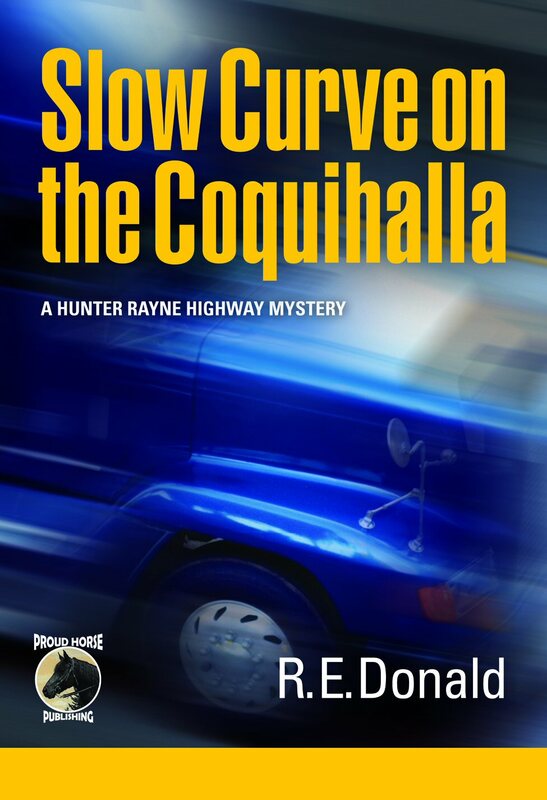 The first mystery in the series is Slow Curve on the Coquihalla. When a well respected truck driver, the owner of a family trucking business, is found dead in his truck down a steep embankment along the mountainous Coquihalla highway in British Columbia, his distraught daughter wants to know how and why his truck left the road on an easy uphill curve. Her resemblance to his own daughter compels Hunter Rayne, a fellow trucker and former homicide detective, to help her find answers. As he uncovers signs of illegal cross border activity originating in a Seattle warehouse, Hunter recruits an old friend, an outlaw biker, to infiltrate what appears to be an international smuggling ring. But while Hunter follows up clues and waits for critical information from his old friend, the wily biker starts to play his own angles. Finally, putting all the pieces together, there in the dark on the same uphill curve on the Coquihalla highway, Hunter risks it all to confront the murderer. The ISBN for Slow Curve on the Coquihalla is 978-0988111806. 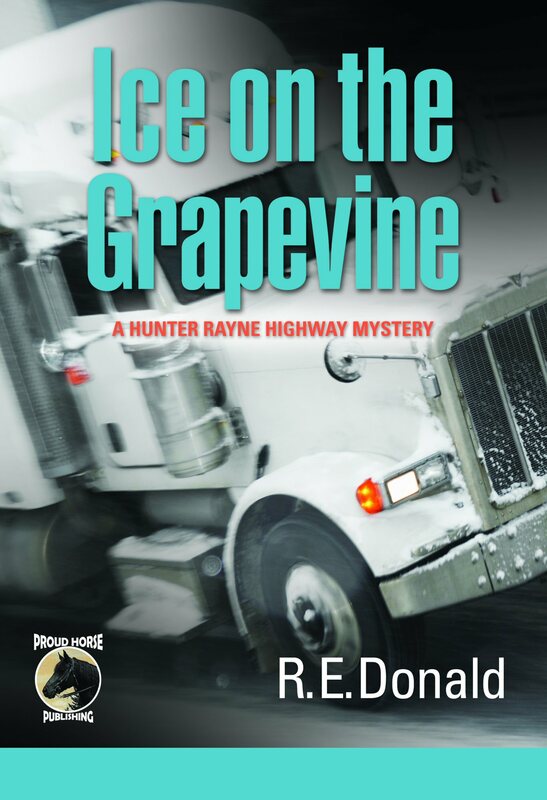 The second mystery in the series, the one shortlisted for the 2012 Global Ebook Award in mysteries, is Ice on the Grapevine. The story opens on a July morning with the discovery of a frozen corpse at a brake check just south of the Grapevine Pass in L.A. County. Hunter, who is in southern California making a delivery, is persuaded by his irascible dispatcher, Elspeth Watson, to help clear two fellow truck drivers who are arrested for the murder. His job is made more difficult by the fact that the suspects, a newlywed couple, won’t speak up in their own defence. The ISBN for Ice on the Grapevine is 978-0988111813. I’m working on the third novel in the series, which will be set primarily in the resort community of Whistler, B.C., which was the location of the 2010 Winter Olympic games. I hope you enjoy reading about my truck driver hero as much as I enjoy writing about him! Tags: British Columbia, Canada, crime, ebook, Global Ebook Award, kindle, kobo, murder mystery, mystery, mystery series, RCMP, Vancouver | Permalink.